Thales Alenia Space has announced that the company's shell for the NanoRacks’ Airlock Module is ready to be shipped to NanoRacks’ integration facilities in Houston, Texas. The NanoRacks Airlock is the first commercial airlock on ISS. Image is courtesy of Thales Alenia Space and NanoRacks. The NanoRacks Airlock Module (“Bishop”) is the first-ever commercial airlock that will operate on the International Space Station (ISS). Owned and operated by NanoRacks, Bishop will be both a permanent commercial module onboard the ISS and also a module capable of being removed from the Space Station and used on future commercial platforms under the NanoRacks Space Outpost Program. Bishop will offer five times the satellite deployment volume than current opportunities available on the Space Station today. The Airlock is manifest to launch on the SpaceX CRS-21 mission. The "Bishop" Airlock Shell ready to ship to NanoRacks. Photo is courtesy of Thales Alenia Space. 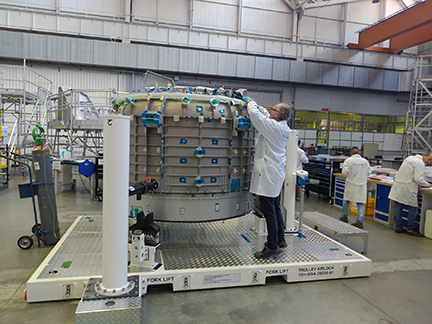 Thales Alenia Space produced and tested the critical pressure shell for Bishop, as well as various secondary structures, including the Micrometeoroid Orbital Debris (MMOD) shields with Multi-Layer Isolation (MLI) panels, the power and video grapple fixture support structure and other structural components. 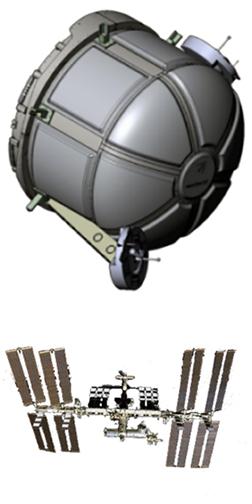 NanoRacks oversaw, and continues to lead, the project management, mechanical and avionics design engineering, safety, operations, quality assurance, mock-ups and crew training, and the final assembly, integration and testing of the Bishop airlock. In April 2018, NanoRacks announced an International Business Development Partnership with Altec and Thales Alenia Space to pursue International Space Station opportunities. Bishop, NanoRacks commercial airlock module, is be considered a part of Altec and Thales Alenia Space’s space product portfolio.